I found a cute little bath & body set on Sasa recently, from their own range Sasatinnie. I love anything with a foody scent so I thought the Ginger Bread range would be nice for the winter months. All comes packaged in a retro gift box (the design is so very 70ies for me). First off, the packaging isn´t the best. 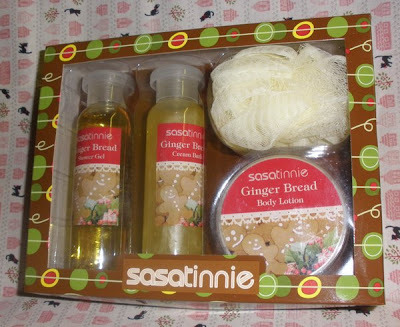 The bottles and jar are made of a quite thin plastic and the tub had leaked body lotion in both of the gift sets I bought so it´s not really nice to give it as a gift in that condition. 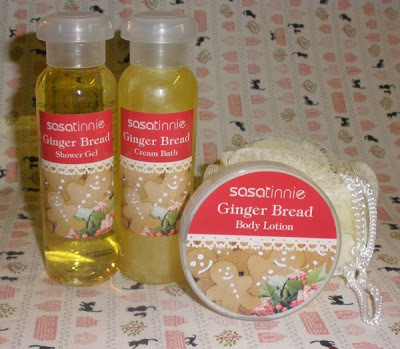 Furthermore this stuff doesn´t even smell remotely like ginger bread, it´s a very basic and nice fresh lemon scent but nothing close to ginger bread. 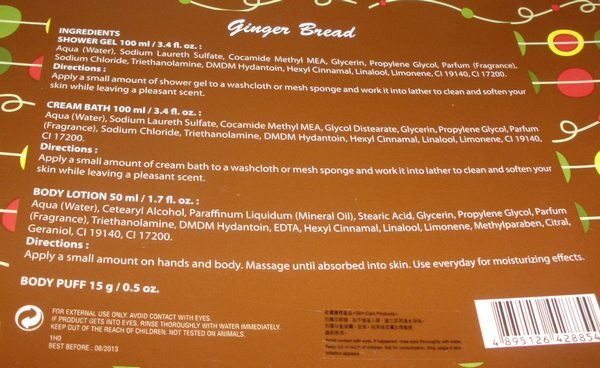 The Shower Gel and Cream Bath are both supposed to be used with the puff as a body wash but what bugs me is that they don´t lather well and the scent is too weak. 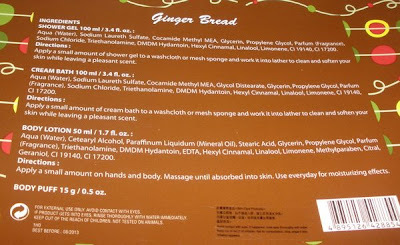 Both don´t dry my skin out but they aren´t particularly moisturizing either. The Body Lotion is the one product I actually like so it´s a pity that there are only 50ml in the jar. As I mentioned before the lotion leaked out of the jar during transit so some got wasted this way, too. The lotion is a bit runny but quite moisturizing on the other hand and leaves my skin nicely scented. It takes a little longer to absorb but not so long to be bothersome. I´d totally purchase this product if it was to be available alone and possibly in either a squeeze-tube or a bottle. Overall the set is performing somewhat weakly so I wouldn´t repurchase.